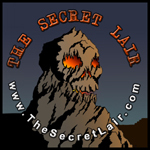 An Update from The Secret Lair | Kris Johnson's Blog…sort of. There’s plenty brewing over at The Secret Lair, most of which is not coffee. While the hosts attempt to establish a more regular podcast release schedule, the Secretary of Artistic Propaganda continues to produce and publish their illustrated adventures. As of this writing, the most recent episode of the podcast involves the movie Watchmen, the series finale of Battlestar Galactica, and the adaptation of various media to film, while the webcomic deals with the upside of radioactive waste. The Secretary of Artistic Propaganda has also created a number of images suitable for use as wallpaper on your desk- or lap-top computing device. The images can be found in the show notes for Episode 0020 of the podcast, and were one to actually listen to that episode, one would be treated to a review of the classic science-fiction film, Silent Running (so long as one has a fairly generous definition of the word “treat”). Finally, the Overlords have created an Intertube forum that interested individuals (or hive minds) may join so as to express their thoughts on various matters of interest to thirty-something geeks. While it is not a requirement that one be a thirty-something geek to join this forum, it may be advisable to spend some time (a la Jane Goodall) with a small group (or tribe) of these geeks in order to learn their ways before attempting to communicate with the larger community. EDIT: All those links to The Secret Lair have been lost in time, like…tears…in rain.